Goldmakher tells Ai about the importance of creativity and ownership in mathematics. When I was in 7th grade, in Boston, I enrolled in an experimental program called The Math Circle, where students discover math on their own. We, the students, came up with all sorts of ideas about number theory, argued with each other, proposed conjectures, shot each other down, and eventually came up with all sorts of proofs. No one told us these things–we made them up. Turns out other people had discovered them earlier, but that wasn’t the point. The point was that we owned them–they were ours because we invented them! This experience showed me that math was creative and could be created by me. From then on, I was totally hooked. Do you take this kind of curiosity into your teaching at Williams College? Absolutely! I think it’s important to learn things before you know why they’re good for you. I also think it’s really important to have motivation from something other than an authority figure. That is what the Math Circle is all about. The teacher showed us this weird thing, and it was up to us to decide what we wanted to prove or discover. This greatly informed my ideas of teaching. My goal is not to transmit information; it’s to get people excited. Information is everywhere. There are textbooks and Wikipedia; we don’t need professors for information. The point is to excite people and get people to start exploring. I go in, I teach, I interact with students, I see a twinkle in an eye, and that’s it, I’ve made my day. In a university setting, you can’t exactly do a math circle model since there is a set amount of material that must be covered, but I try to make my classes student driven. I guess Math Circles really started you along the number theory route. Could you talk a little about your research in number theory? My research is in classical number theory. At a fundamental level, I am trying to understand structure and randomness within the primes. I think of primes as atoms: you take any whole number and break it down into parts, which are the primes. The question is if there is any sort of rhyme or reason to them. Is there a way to find out what the millionth prime is? Well, you could just go one by one and find the next prime and the next prime and eventually say, that’s the millionth one! This is obviously not a great way to do it. Is there a shortcut or a formula for figuring out the nth prime? My theorems are about subsets of the primes and trying to understand how noisy and how structured they are. How was your grad school experience? I was extremely lucky to have an amazing PhD advisor. His name is Kannan Soundararajan (he goes by Sound). He not only met individually with each of the students every week to talk about their progress, but also met with all of his students once a week all at the same time to talk about half-baked pre-ideas. They were along the lines of “What if I could do this?” or “Here’s a set-up of what I would like to work on.” We would shoot out all these pre-ideas. It was fascinating to see how people thought about and approached ideas. It was especially amazing to see how Sound thought and how his intuition worked. Was there a most difficult moment? I’d say all of it was difficult. There’s the course part of grad school, but at least the goals are well-defined. Then comes the research, which is frustrating. You have no idea what the goals are, and you don’t have a concrete, specific statement you are trying to prove. When I was out there, I really started getting demoralized by my lack of progress. I had been working for a while and I hadn’t really discovered much, if at all. It became clear to me that not only was I nothing compared to the faculty, but also I did not measure up to the students. In some ways it was inspiring, but also very demoralizing. I was getting pretty close to quitting. How did you overcome this impasse? He said, “Why is that?” I said, “You know, it’s clear. I look at Sound, I look at myself. He’s supposed to be a mathematician, I’m not.” Then he said, “You know, most mathematicians aren’t as good as Sound.” I said, “Yea, but I look at the other students, and they’re on another level.” And he said, “You know, most mathematicians aren’t as good as the other students either.” His words had a huge impact on me. Later in the year, I ended up making my first progress and proved a theorem. Once I knew that it was possible for me to discover a result, there was a psychological shift. 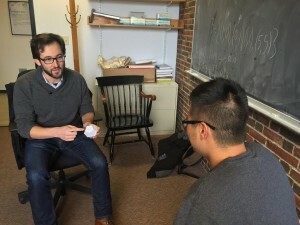 Leo Goldmakher is Assistant Professor of Mathematics at Williams College. Stephen Ai is a current sophomore at Williams studying mathematics and music; his favorite piece is JS Bach’s Mass in B Minor. Stephen Ai is a current sophomore at Williams College studying mathematics and music. He is interested in applications of mathematics to music theory in Neo-Riemannian theory. His favorite piece is JS Bach's Mass in B Minor. This entry was posted in Interview, Math, Math Teaching, Uncategorized and tagged career advice, creativity, curiousity, interviews, Leo Goldmakher, Liberal Arts, math circles. Bookmark the permalink. Almost all of us, myself definitely included, have been in that situation. It’s hard, but I try not to be too discouraged when the comparison is not favorable. Instead I focus on what I can do better (while it’s hard to will oneself to be more creative, there are a lot of items in graduate school and beyond that you can control) and take pride in the fact that occasionally I do come up with a theorem, result or observation that the big guns find interesting.